Earth Rhythms Queen Kit is a custom cut kit including all fabrics to piece quilt top and binding, plus pattern. A large variety of batiks are included with this kit which will make the design very scrappy. 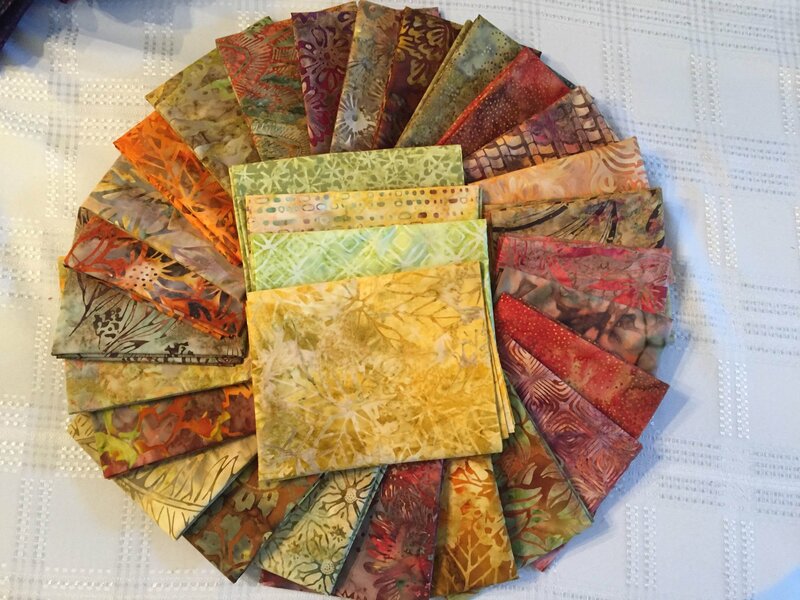 Included are borders, 27 medium batik fat quarters, 4 - 3/8 yard cuts of bright batiks for the sparkle in the design, and a variety of 10 shades of brown batiks and a brown binding. The pattern is written for regular yardage, so 1 extra medium and brown fat quarter are included to offset any discrepancy in cutting. Photography includes fabrics used in kit. Photo of Earth Rhythms quilt is an example of the quilt you will be creating in a scrappy style (with fabrics referenced in first two photos). Queen Size: 91" x 104"